Two top civilian officials from Hawaii's Emergency Management Agency have resigned over the sending of a false incoming missile alert. The 13 January message led to widespread panic and the authorities took 38 minutes to correct it. Administrator Vern Miyagi and executive officer Toby Clairmont stepped down on Tuesday after reports detailing the agency's failures were released. The individual who sent the alert has also been fired, officials confirmed. "A combination of human error and inadequate safeguards contributed to this false alert," the Federal Communications Commission (FCC) said in a preliminary report into the incident released on Tuesday. The report said the mix-up happened after a midnight supervisor at the Hawaii Emergency Management Agency decided to conduct a spontaneous drill during a shift transition. The incoming day supervisor was then said to be unaware the 08:05 drill would involve any incoming day officers, who were then not told about the exercise. The drill message, which was called in pretending to be from US Pacific Command, began and ended with the words: "Exercise! Exercise! Exercise!". But the warning also said "This is not a drill", in a script that the FCC say was different from established procedure. According to the federal report, the employee was one of three who received the call but did not hear the exercise warning. Believing it was real, they said they sent out the genuine alert out using the agency's software. The official whose identity remains unknown, was temporarily reassigned after the incident, but has now been fired from the agency by state officials. The FCC said the employee had so far refused to cooperate with investigators beyond submitting a written statement. A state report also released on Tuesday said the employee had a record of "poor performance" on the job. Reports say he had been a source of concern for colleagues for 10 years, having confused emergency drills with real life incidents on at least two occasions. 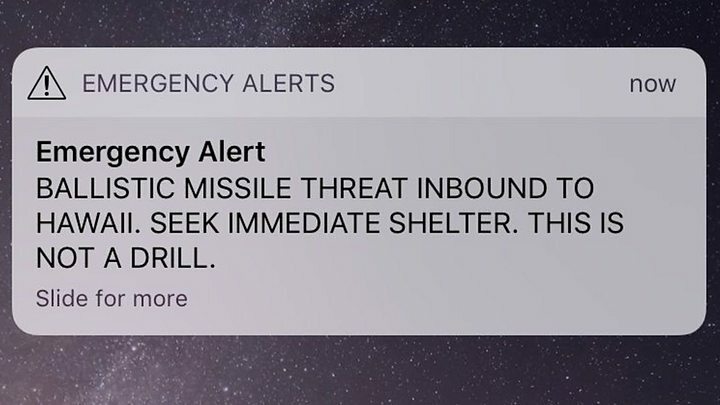 The FCC report acknowledged that the Hawaiian agency had already taken steps to avoid a repeat of the incident, and now required secondary approval before an alert could be sent out. Previously they did not have checks in place to stop individuals sending out a warning to mobile devices and state radio and television without higher approval. The report alleges the agency was conducting an "atypical" amount of drills without prior notice, which federal investigators say "heightened the potential for an error to occur". They are also said to have failed to develop procedures for response to any accidental false alarm, resulting in them having to use social media to correct the mistake.